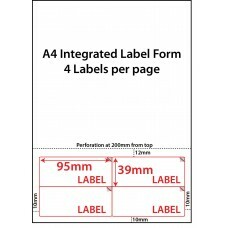 Integrated labels are sheets of standard printer paper that have an adhesive label die cut into them which creates a form that can be used to integrate the invoicing/packing process with the shipping process. 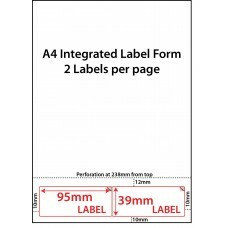 The user can print their picking slip/invoice and the address labels are printed at the bottom of the sheet all at the same time. 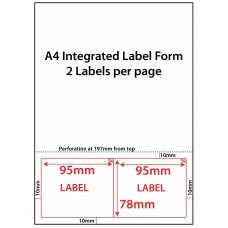 This helps to eliminate errors and reduce labour costs, as the whole pick and pack process is done efficiently and effectively in one step. 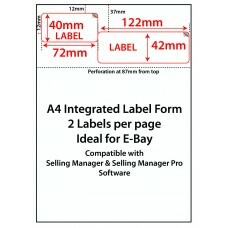 Instead of having a separate picking slip/invoice and then separate address labels, the user can print the form, peel off the shipping label, place the remaining document (invoice/picking slip) in the package for the customer, seal the box and apply the label, ready for the courier to collect the goods. 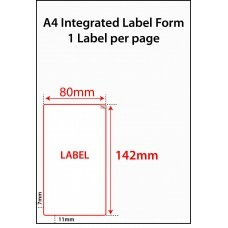 The integrated labels forms are ideal for ecommerce sellers, shops, factories, warehouses – in fact any business that sends out products and requires invoices, picking slips, address labels, etc. 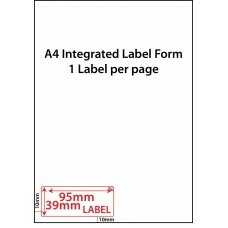 The integrated labels forms can also be used for business applications such as medical forms with pharmacy labels, barcode labels, product return labels, marketing labels or any other application that paper documents are required as well as an adhesive label. 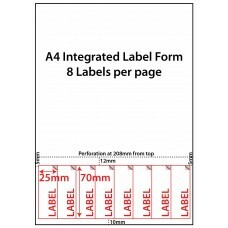 Our integrated labels forms can also be custom made to suit any size label or position, so if you can't find what you are looking for then please contact our friendly customer service staff who will discuss your labelling needs.